DUNDEE--The Watkins Glen girls varsity soccer team topped Dundee, 10-2, Thursday, Sept. 6. Hannah Morse and Taylor Kelly both scored three goals. Morse also assisted three times. Danielle Leszyk had two goals and two assists, while Haley Dean and Abby Gibson each scored once. In goal, Cierra Barber posted nine saves. The Senecas fell to Newark Valley, 7-1, in an away game, Tuesday, Sept. 4. Morse scored for Watkins. Goalkeeper Barber had 20 saves. Watkins Glen had three corner kicks. "We ran into a very talented Newark Valley team tonight," said Coach Scott Morse. "The girls fought hard we were just never able to put together long stretches of solid play. They never quit and hopefully we can use this game as a learning experience going forward." The Senecas' boys varsity soccer team lost to Southern Cayuga, Saturday, Sept. 8. The final score was 3-0. The Watkins boys team lost to Marathon, 4-0, Thursday, Sept. 6. Watkins Glen had three shots on goal. Watkins' Gabe Planty finished first individually at the Red Jacket Invitational, while the team took seventh overall, Saturday, Sept. 8. Planty ran with a 16:04 time. Max Evans placed 18th (17:37), followed by Steven Gublo in 41st (18:45). Ben Swinnterton was 81st (20:11). Elliott Holland took 107th (21:17). The girls also competed, but did not have a full team. Kai Sutterby was ninth (21:20). Breanna Carl finished 17th (21:52), while Makenzie Kellogg was 36th (23:09). The Senecas' varsity volleyball team beat Newark Valley, 3-1, Thursday, Sept. 6. Katie Losey earned 12 service points, five aces, eight kills, and one assist. Adrienna Solomon added 10 service points, four aces, and five kills. Claudia Parker also had 10 service points, three aces, and one kill. Ali LaMoreaux posted seven service points, two aces, and one kill. Kelsey Kernan earned six service points, one ace, two kills, and 24 assists. Watkins fell to Waverly in three sets, Wednesday, Sept. 5. Kernan had eight service points, five aces, and six assists. Solomon posted five service points, one ace, one kill. Carlie Baker added four service points, one kill, and four blocks. Losey contributed two service points, two assist, and three kills. Mattie Yontz also had two service points, while Olivia Stephani earned two kills. ODESSA--The Seneca Indians varsity football team fell to Susquehanna Valley, 56-22, Saturday, Sept. 8. "Being down 42-0 at the half is never a great way to start, but when our team came out in the second half and kept grinding away and put 22 points on the board, that's a big positive," said Coach Trevor Holland. The combined Watkins Glen/Odessa-Montour team had 304 total yards on the offense. Zach Elliott earned 177 yards on 27 carries, with three touchdowns. Joe Chedzoy added 73 yards on 26 carries. Casen Weeden posted 20 yards on four carries. Passing, Derrick Lewis had 33 yards. Wrett Brower and Owen Scholtisek both had eight tackles. Elliott added six, while Chedzoy earned five. The Indians' girls varsity swim team lost to Elmira Notre Dame, 46-44, in its first game of the season, Thursday, Sept. 6. Kara Reese won the 100 backstroke (1:20.77) and was second in the 100 freestyle (1:04.77). Tori Reese took first in the 100 breaststroke (1:19.05) and second in the 100 butterfly (1:09.35). Madison Moss placed second in the 200 IM (2:55.86) and 500 freestyle (7:27.47). Emilee Chaffinch was second in the 200 freestyle (2:47.29). Reagan Reese finished second in the 50 freestyle (34.33), while Megan Adams was second in the 100 backstroke (1:21.66). The Odessa-Montour girls soccer team lost to Waverly, 6-0, Thursday, Sept. 6. Grace Vondracek made six saves. The girls soccer team defeated Tioga 8-2, Tuesday, Sept. 4. Kennedey Heichel and Alexis Saunders each had two goals. Ida Sidle, Vondracek, Olivia Grover and Hunter Daugherty had one goal each. Odessa's boys soccer team defeated Moravia 3-1, Friday, Sept. 7. Goals were scored by Brett Walters, Justin Andrews and Paden Grover. The Odessa-Montour volleyball team lost to Spencer-Van Etten, Friday, Sept. 7, 3-1. Jacy Knapp had four aces, three kills, 14 digs and nine service points. Hannah Chapman added two aces, three kills, seven digs and six service points. Karlee Dudgeon recorded 25 digs. Isabel Foote had 15 with three aces. PENN YAN--The Penn Yan girls varsity soccer team blanked Romulus, 4-0, Friday, Sept. 7. Hayley Andersen scored three of Penn Yan's goals. Marrianna Dalglish and Grace Ledgerwood each assisted once. The final goal was scored by Triana Burgos-Farnan, with an assist from Sierra Harrison. In goal, Elle Harrison had one save. Penn Yan fell to Mynderse, Wednesday, Sept. 5. The final score was 1-0. Harrison posted 13 saves in the goal. The Penn Yan boys varsity soccer team lost to Marcus Whitman in overtime, Saturday, Sept. 8. The final score was 1-0. Penn Yan's Mason MacKerchar had two saves in goal. The Mustangs fell in overtime, 3-2, to Newark, Tuesday, Sept. 4. Wally Young and Tyler Griffin both scored, with assists from Brendan Pinckney and Cole Egburtson. In the goal, MacKerchar posted four saves. The Mustangs' varsity football team beat Geneva, 35-21, in an away game, Friday, Sept. 7. Geneva had the lead through the first half, with a 21-19 score at halftime. The Mustangs turned the game around in the second half and kept the Panthers from scoring during the rest of the game. Conner Fingar had 25 yards on four carries, with a touchdown. William Rogers had 29 yards on nine carries, with a touchdown. Mekhi Mahan posted 32 yards over seven carries and one touchdown. Finger also recorded 107 yards on 10 receptions, with a touchdown. Kyle Berna posted a total of 105 yards over 13 receptions, with a two-point conversion. Brennan Prather added 56 yards on four receptions, with a touchdown and a two-point conversion. Mahan also successfully received twice to earn 91 yards and a touchdown. Passing, Rogers was 30-for-40 for 388 yards, with three touchdowns and two two-point conversions. On the defense, Fingar had nine tackles and an interception. The Penn Yan varsity tennis team topped Bloomfield, 5-0, Friday, Sept. 7. In singles, Molly Pullen beat Carlie Layton, 6-0, 6-0. Claire Pullen defeated Allison Coffey, 6-1, 6-1. Sam Denson won against Lauryn Scott, 6-0, 6-0. Sydney Moravec and Abby Garvey topped Jordan Rickett and Lauren Murray, 6-2, 6-1. Jayden Hollister and Grace Worth beat Jordan Harter and Ali Klube, 6-1, 6-1. The Mustangs also beat Geneva Thursday, Sept. 6. The final score was 5-0. Molly Pullen won against Lauren Schmit, 6-1, 7-6(7-2). Claire Pullen beat Natalie Berg-Pappert, 6-0, 6-1. Moravec defeated Kirsten Ryan, 6-2, 6-0. In doubles, Hollister and Garvey topped Sara Wright and Sarah VanDeMortel, 4-6, 6-0, 6-4. Brooke Carmel and Worth beat Carter Moore and Winnie Tang, 6-4, 3-6, 6-2. Penn Yan's varsity golf team topped Waterloo, 223-258, Thursday, Sept. 6. Clayton Koivuniemi led with a 43. Peter Nicholson and Kevin Smith both followed with scores of 44. Cameron Bassage earned a 47, while Max Brodmann had a 48. Penn Yan's varsity volleyball team beat Geneva in five sets, Tuesday, Sept. 4. The scores were 22-25, 25-23, 25-10, 18-25, 25-21. Caitlin Wunder posted 27 kills and 41 digs. Serina Sheradin earned 33 assists and 40 digs. Akiya Brewer had 51 digs. DUNDEE--The Dundee varsity football team lost to Clyde-Savannah, Saturday, Sept. 8. The final score was 34-16. Joshua Cramer led with 105 yards on 17 carries, and a touchdown. Preston Cratsley added 57 yards over eight carries. Cratsley was also 4-for-13 passing, with 55 yards and one touchdown. Gabriel Kirkendall had 31 yards with five carries. Austin Gibson had 39 yards receiving, with a touchdown. Kenneth Empson Jr. added 16 yards on one reception. Cramer led with 10 tackles on the defensive. Preston Cole earned five tackles and one sack. Gibson posted four tackles, while Cratsley and Empson each had three. The Dundee girls varsity soccer team fell to Harley Allendale Columbia, 3-0, Friday, Sept. 7. 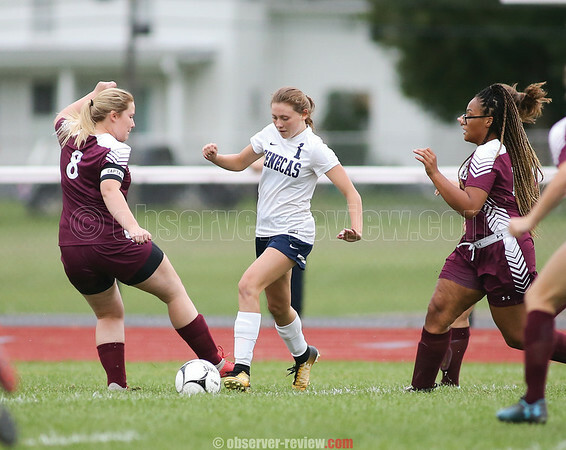 The Lady Scots were beaten by Watkins Glen, Thursday, Sept. 6. The final score was 10-2. Haille Empson scored both goals for Dundee. The Scots' varsity volleyball team lost to South Seneca in three sets, Wednesday, Sept. 5. Mackenzie Strait posted four kills, one block, and one ace. Megan Sutherland had three assists and one ace, while Dalaine Nolan added three kills. FILLMORE--The Hammondsport varsity volleyball team defeated Fillmore in three sets, Friday, Sept. 7. The final scores were 25-16, 25-14, 25-16. Shelby Sherman led with 14 aces and nine kills. Erika Hilligus and Pia Bacubac had six and four aces respectively. The Lakers beat Arkport, 3-0, Wednesday, Sept. 5. The final scores were 25-8, 25-13, 25-11. Julia Bennett, Brianna Pratt, and Hilligus each earned seven aces. Bennett also put down 10 kills in the win. The Hammondsport boys varsity cross country team placed fourth at the Alfred University 4K, Saturday, Sept. 8. Thomas Kressley took second (13:30), followed by Liam Kressley in 20th (14:48). Matt Lyle placed 27th (15:25). Eli Hill took 40th (16:39), while Mike Beam was 42nd (16:54). For the girls, Morgan Cheney placed 17th (21:58). Isabel Sprague finished in 21st (23:48), while Emma Thompson took 22nd (25:04). The Lakers' girls varsity soccer team fell to Belfast, Friday, Sept. 7. The final score was 3-0. Goalkeeper Megan Allen had six saves. Hammondsport lost to Canisteo-Greenwood, 9-0, Wednesday, Sept. 5. In the goal, Allen made 21 saves. The Hammondsport boys soccer team defeated Marcus Whitman 2-0, Thursday, Sept. 6. Alex Davis and John Wells scored with Ben Cole assisting.